In May 1813, forces commanded by General Harrison withstood a British siege on Fort Meig in Ohio. When a relief column arrived, the British and the Indians withdrew. The fort had been the center of American activity in the Maumee River region of Ohio and served as a major obstacle to the British. The siege began on April 12, 1813 with an attack by the British and Indians. Even though he was outnumbered 4 to 1, Harrison refused to surrender and was able to break through the siege a year later. General Harrison built Fort Meigs on the rapids of the Maumee River in Ohio on February 2 1813. It became the center of American activity in the region. The fort was well built. For the British the fort was a major obstacle to further advances in the region. On May 1st the British began a siege of the fort. General Harrison was in the fort when the siege began. The British demanded that the Americans surrender. Even though he was outnumbered 4 to 1 Harrison refused. He e horted his men to withstand the coming siege by saying: "Can the citizens of a free country think of submitting to an army composed of mercenary soldiers, reluctant Canadians, goaded to the field by the bayonet and wretched, naked savages." The British began a bombardment. Much to their surprise their cannon balls had no effect on the fort, which was surrounded, by dirt mounds. Proctor decided to engage in a lengthy siege. 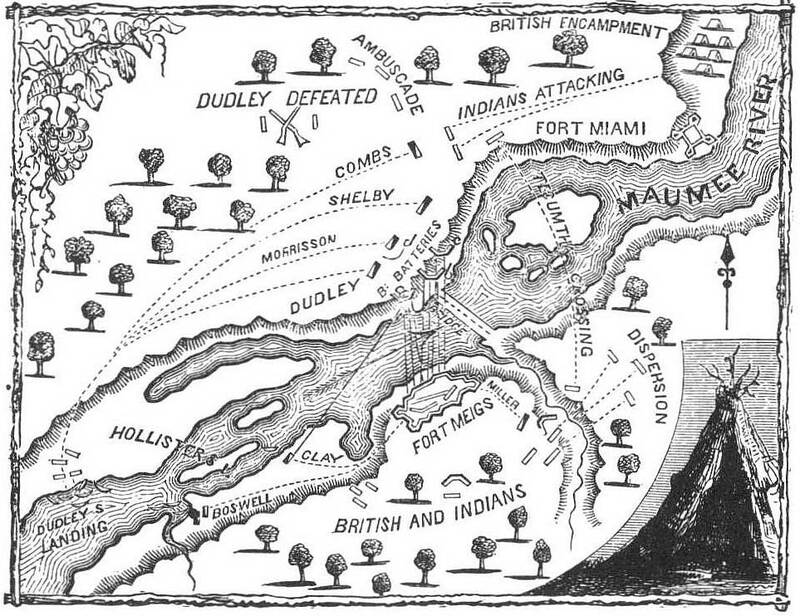 However, this was not the sort of fighting that the British Indian allies under Tecumseh were used to and many began drifting away. When a relief column of Kentucky militia managed to reinforce the fort, Proctor decided to withdraw. On May 9th the siege was lifted.